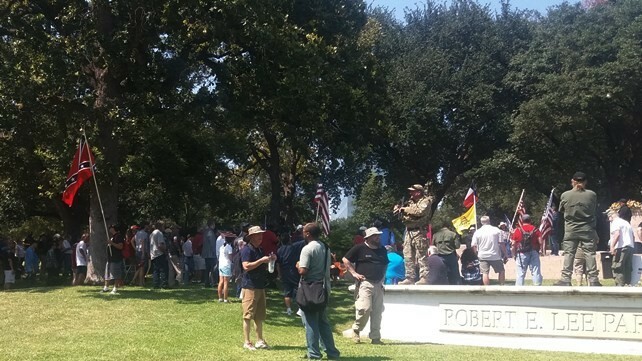 DALLAS, Texas — Around 200 people gathered Saturday afternoon in Dallas at Lee Park to protest the removal of a statue of Confederate General Robert E. Lee and an unknown soldier. Peaceful protesters stood in the blistering 90-plus degree heat while facing the barren pedestal where Lee’s bronze, 14-foot tall, six-ton equestrian likeness stood from 1936 until Thursday. 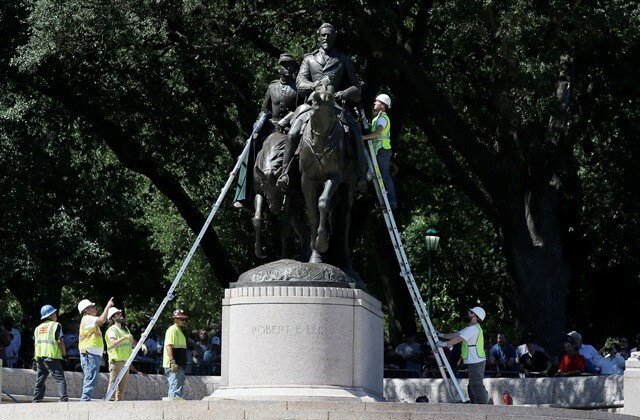 Dallas officials sent in city work crews to warehouse the statue. 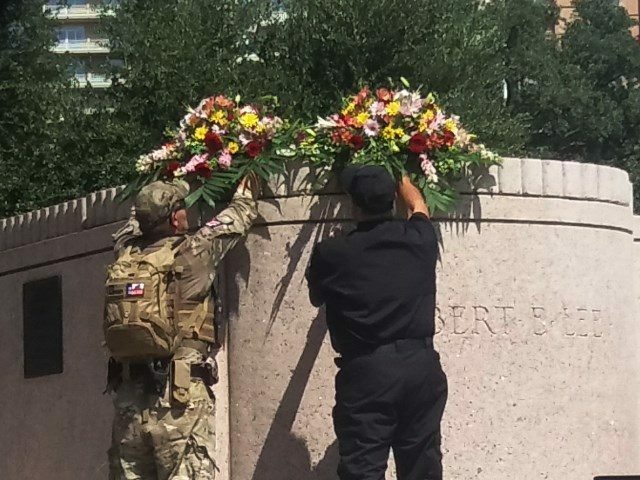 Breitbart Texas reported the Dallas City Council deemed the monument “a symbol of white supremacy” in a recent 13-1 vote. All that remains of Lee is his name chiseled into the stone base. 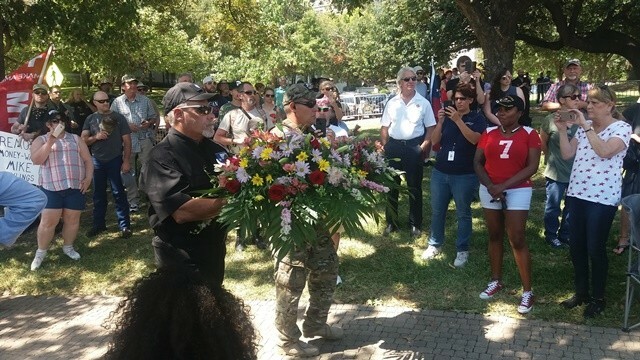 A lone agitator, an older white man wearing a “Black Lives Matter” T-shirt paraded into the park waving a white “surrender” flag before the rally began. Identified as Al Woolum, he got into a fracas with people who came to support the preservation of Texas history. Dallas police said officers arrested the man and charged him with disorderly conduct. Officers largely remained outside the park throughout the two-hour event. 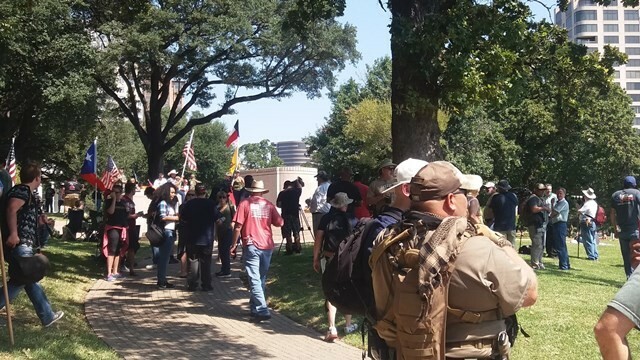 The Texas Liberty Coalition stood armed around the park’s perimeter. Many attendees carried flags – American, Texas, Gadsden, and the Confederate battle flag. One woman waved a flag which read “Come and Take It,” the slogan from the historic Texas revolutionary Gonzales flag. Texians flew that flag in a battle where Mexico sent troops to reclaim a cannon the town used to defend itself from hostile Indians. Others held signs expressing frustration with City of Dallas officials, notably Mayor Mike Rawlings, over the decision to remove the statue of Lee. The signs read: “Restore General Lee, Remove Rawlings;” “Recall Rawlings;” “Preserve America’s History;” and “Mayor Rawlings, Dallas is broke. You waste money on moving Robert E. Lee. Shame on you.” The last sign alluded to the police and fire department pension fund crises. Featured speakers included Beverly, former Dallas Councilwoman and Democrat Sandra Crenshaw, radio host John B. Wells, and conservative black pastor Jeffrey Myers who called the statue’s removal a “monumental mistake.” A black medical marijuana activist spoke on the role cannabis played during the Civil War for wounded soldiers and Lee’s support of its medicinal use. She founded the Dallas Area Black Americans for Democracy, a group aligned with Sons of Confederate Veterans and the Buffalo Soldiers in the war against eradicating Texas history. Last month, Breitbart Texas reported Crenshaw called the efforts of city officials who want to tear down Confederate monuments a misguided attempt to erase racism. Beverly and Crenshaw addressed the hypocrisy of the city removing Robert E. Lee’s likeness but leaving up a statue of Robert L. Thornton, the Democrat mayor of Dallas from 1953 to 1961 and a prominent member of the Ku Klux Klan. The monument commemorating Thornton sits at Fair Park, the site of the Texas state fair. Portions of two interstates and one Dallas elementary school also bear his name. “Tell Mr. Caraway, he got the wrong Robert,” chided Crenshaw, referring to Dallas Mayor Pro Tem Dwaine Caraway, the lead voice of three black councilmen who rushed a resolution to a vote last week that ended with shuttering Lee’s statue. 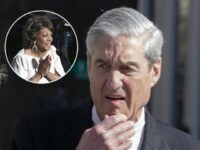 The former public servant added she “protested the city of Dallas made this decision without due process,” criticising the minimal input officials allowed residents. Crenshaw sternly noted this is not the way Texans operate, underscoring that Texans “work together” to learn and respect each other’s history.” For example, she cited how former Governor Rick Perry appropriated $2 million towards two statues that flank the Confederate Soldiers monument at the Texas Capitol, one for Tejanos and the other for African-Americans, each honoring their contributions to Texas. Rally attendee and Dallas resident Joe felt similarly. He told Breitbart Texas he was of Mexican ancestry. “This is not about race. This is about preserving American history whether it’s good or bad. It must be preserved so that my children and grandchildren can learn about it.” He feared that blotting out the past leads to repeating it because those “reminders” are lost. One North Texan told Breitbart Texas he feared those who want to tear down history will come after the Tarrant County city where he resides, Arlington, named for Robert E. Lee’s Virginia home, the Arlington House.